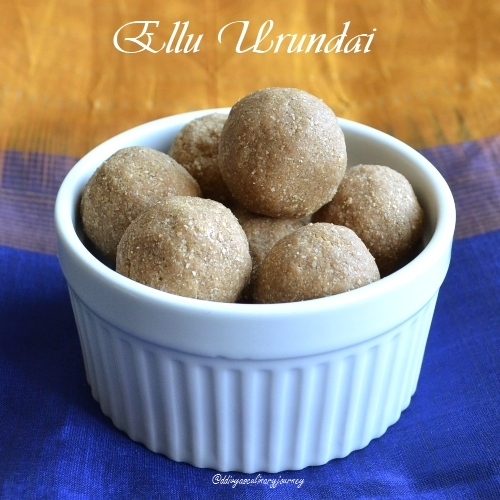 Today's recipe is Ellu urundai. I can't believe how simple it is, to make this dish. It required just 2 ingredients- sesame seeds and jaggery. When I came across this recipe, I definitely wanted to try this. I tried this morning and it tasted awesome, brought back all the child hood memories. It is after so many years am tasting ellu urundai. Try roast the sesame seeds till they lightly change colour and aroma starts coming out. Grate the jaggery or powder them. Let the sesame seeds cool down a little and powder them coarsely in a blender. Then add the jaggery and blend them in the blender. Take 2 tablespoons of this mixture and roll them into balls. You can use black sesame seeds, I have used white sesame seeds here. If needed, you can add some cardamom powder too, just a pinch for flavor. This is one my fav sweet !! Looks so yummy !! I love the pictures, looks awesome. This dish has just 2 ingredients that can wow everyone. Nicely done Divya! This is our family favorite. We usually make it around Lohri and call 'Til Pinni' or "Kuller". Simple and delicious, my grandma makes without grinding them. This is our favorite easy to make sweet. 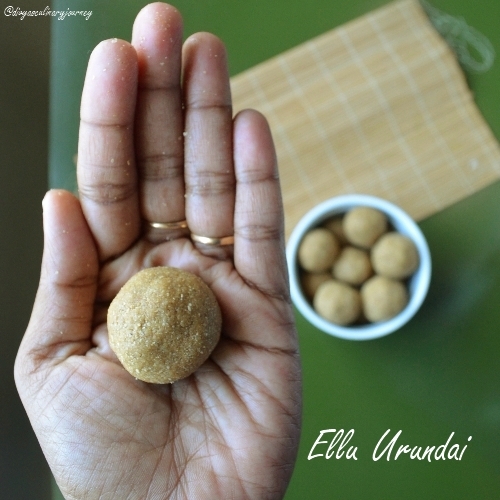 Super..i like that picture of ellu urundai on your hand..
Haven't tried nor heard of Ellu urundai...but it sure looks good to munch on! Yummy and healthy,my favorite too..
Feel like having some, yummy and delicious laddoos.